The only accusation a political enemy can throw at a good leader is corruption. The late President Ferdinand E. Marcos is still condemned by many after his death due to the alleged ill-gotten wealth. Former Vice President Binay suffers the same fate with the same media propaganda format. Then now, the same people behind their successful character assassination machine is trying it on, Bongbong Marcos. 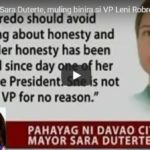 [VIDEO]: Here are reviews of good leaders discredited by media propaganda: Ferdinand E. Marcos, Jejomar Binay and now, Bongbong Marcos? Character! That’s what makes a good leader. In thoughts, words and in deeds, a good leader put the people first. The one who tries to unite even with the enemies for the sake of the majority. One that would prioritize public services for the welfare of his people. The late President Marcos did not stop supporting his friend, Ninoy when he was exiled in the US. Then First Lady Imelda Marcos also made sure that the Aquino family were taken cared of and safe from threats. 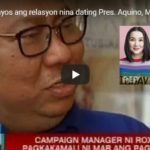 But the late ex-Senator Benigno Aquino chose to use his media influence to get what he wanted. 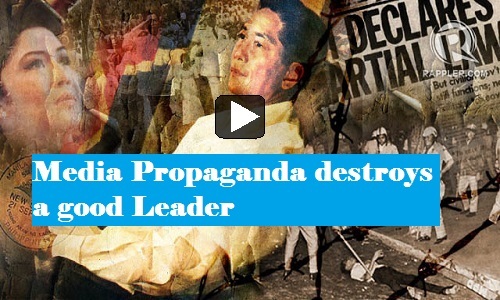 Thus destroying Marcos in the end and put his widow and son in the country’s top position for two consecutive terms. Where can you find a senate probe that is very noisy only during elections? Only during the Binay Senate probe. Corruption allegations are all over tri-media. With so-called soap operas that really convinced most Filipinos who do not know the real score that the Binays are into no good. Where are those senators who accused Former Vice President Jejomar Binay of corruption? 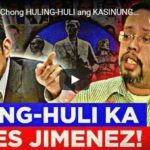 They have another show going on – and its the media propaganda against Senator Leila de Lima and the President himself, Rodrigo Duterte. Anyone could guess it right that Bongbong Marcos, son of the late strongman who is a tough presidentiable in future elections will be an easy target of media propaganda. In fact, at the moment, he is already accused of pocketing his pork barrel which he denies of course. It can be observed that the detractors of Marcos and Binay are very insecure. They are not only threatened by the legend of the two leaders – but also the rest of their family members. Any attacks launched against them would only not discredit them but including their family. Why is this so? Could the Marcos-Binay be the answer? Sooner or later, good leaders will emerge that would fulfill the promise that they will lead , making the Philippines a great country again. Could Bongbong Marcos be the next president and one from the Binay siblings be the next vice president?